Expecting Rain • View topic - Should Bob give up or reduce his live shows now? Should Bob give up or reduce his live shows now? Post subject: Should Bob give up or reduce his live shows now? Just wondering if he (his voice) would benefit more from a much lighter touring schedule? Maybe focus more time working in the studio/writing? However, I do appreciate touring is all he knows and this makes him the great troubadour he is. Post subject: Re: Should Bob give up or reduce his live shows now? Well, his singing has been superb these past few years. What's the problem? Perhaps Aylong hasn’t witnessed a live show? Well, his singing has been superb these past few years. I saw him last year at Wembley arena....really enjoyed it. Like a lot of you, many times down the years too. I just wondered if a more subtle setup (in the same vein as his performance at the White House) could mean the diction of lyrics could be heard a bit better. Sometimes I struggle to make out what he is singing when I see him live. to the masses over the years, so it’s possible your point may be moot. 3. Damn, I got a phone call and now I forgot the 3rd thing! Rows 1-3, even 1-5, are not the best for audio/hearing (becoming worst as time passes) and is not only in Bob's world. It's a real statement since quite a lot of years. In all honesty, I'm always so excited to actually be at the concert that all my senses merge into one big ball of awe and I sit there in a state of bliss. After the show, I go home and hope someone taped the concert so I can listen to it. Not when so many people go to see him play still. I'm hoping for a Japan tour later this year or next year. Last time I saw him was in Copenhagen's Opera House, and from where I was (first floor, row 2, quite center) the sound was superb and the diction excelent. Hope in Madrid (Auditorio Naconal, Philharmonic Hall) and Barcelona's Opera (Gran Teatre del Liceu) will be the same, from Salamanca's Pabellón Multiusos I don't have the same expectations. Relative to whatever you care to mention. The correct answer is absolutely No. NO. Why should he? Because he has been playing excellent concerts in 2014, 2015 and 2017? The answer my friend, that is blowin' in the wind, is: no. 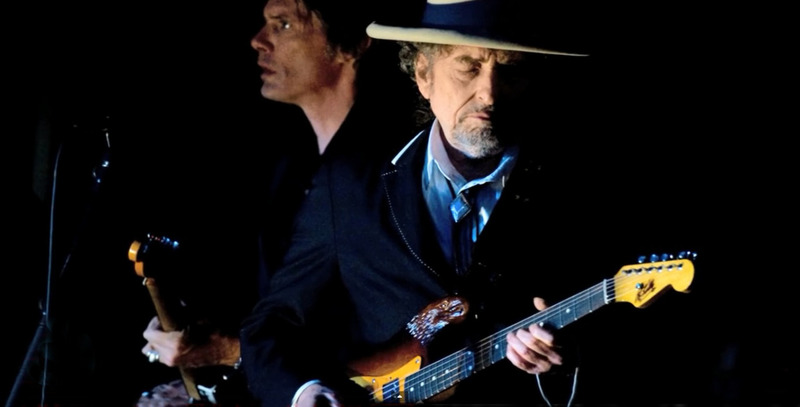 Hasn't Bob reduced his touring schedule in the last couple of years? He used to do close to one hundred shows a year, now it's down to around eighty. And I guess Bob feels quite comfortable with that number. So for me, I just hope he keeps up this level of touring. I think hes on the road slightly less. I'd prefer he tone it down to small intimate clubs and venues with seating of no more than 500. Good to see Phil Spector's syrup has landed a new gig. Yes I'm all for smaller venues as well. I'm really happy that Bob is touring at all to be honest. I still get a buzz from his concerts, long may they continue. Thanks for sharing this, first time I've seen it! What is the tune they are playing? The Palace Theatre (Chicago) shows of 2014, Milwaukee Riverside in 2015, and WinTrust (Chicago) last October tell a tale of an artist in very fine form indeed. Wonderful concerts. Looking forward to Dylan's return to Chicago by year's end. Don't you dare miss it! His voice is fine now. I don't know enough about music to be able to describe the changes but I don't like them. I preferred his County/Rock sound around the turn of the century. I just don't like the sound now.